Crownceryl is a mixture of broad-spectrum antibiotics together with multivitamins. This product is able to take care of both gram positive and gram negative bacteria while also relieving the stress caused by those microbes in the process. 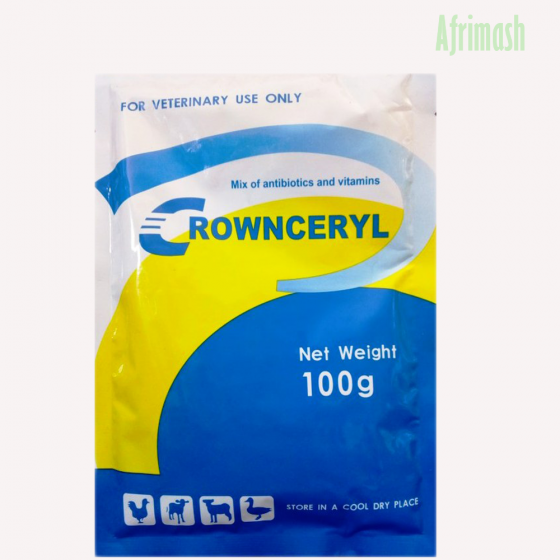 Crownceryl contains multi-biotics for the treatment and prevention of conditions such as; chronic respiratory disease, infectious coryza, fowl cholera, gastrointestinal diseases, omphalitis, etc. The multivitamins contained in this product helps in the maintenance of optimum performance in healthy animals. For maximum result, use only medicated water during treatment. Medicated water should be used within 24hrs, discard afterward.